MSD Fuel Injector UNIVERSAL - Dezod Motorsports Inc - Home of the automotive performance enthusiast since 2002. MSD Fuel Injectors are the answer to your fuel woes. The static flow rates (pound per hour) are approximate with fuel pressure set at 43.5 psi (3-bar) and fuel specific gravity at 0.788. The flow rate tolerance between individual injectors of the same static flow is 1.5% -3%. 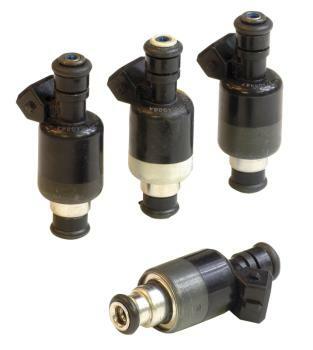 MSD’s new Jammer Fuel Injectors are the most linear injectors available. With exceptionally precise fuel control, they offer excellent idle and driveability. Jammers work with both saturated or peak & hold ECUs, and are compatible with Bosch square connectors.